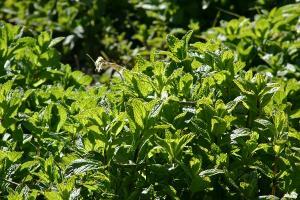 Mints (Mentha spp.) are so easy to grow, they're in the category of 'plants that are hard to kill'. This can be an issue if they become invasive in your garden, but for the most part mints bring pure olfactory pleasure to the landscape - and make a lush, attractive groundcover in the process. Mint is very useful in the kitchen - for flavoring tea, cocktails, desserts and a variety of ethnic dishes - and it's much nicer to grab a fresh sprig from the backyard rather than buying it at the store. 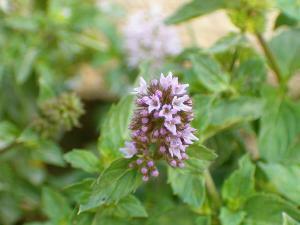 Some types of mint also have medicinal uses, such as calming nausea. There are a variety of mints with slightly different flavors and aromas to explore. In general they have deep green, oval-shaped leaves and tiny tubular flowers (white, purplish or pinkish) that emerge in dense clusters encircling the topmost portions of the stems in summer. Most mints grow as an eight to 12 inch groundcover, extending another six inches or so when they are in bloom, though some form a creeping mat less than three inches tall. They spread by runners along the surface of the soil and can quickly expand to cover large areas where growing conditions are ideal. Mints work well as a potted plant, a tactic that will keep them from running all over the yard. They can even be kept in a pot on the kitchen windowsill. Mints are useful as a naturalized groundcover in shade gardens, especially among larger plants that can hold their own as the mint colonizes the ground around them. Avoid planting mint in perennial or annual flower beds, vegetable and herb gardens, bulb plantings, etc - anywhere that it runs the risk of crowding out plants that do not grow at least twice as tall as it does. 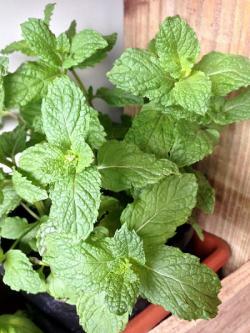 Mint grows best in a location with partial sun and moist, fertile soil. Most mints can actually tolerate boggy soil, but dry soil will limit their growth. You can buy special mint varieties at nurseries, but if you know someone with a patch it's easy to just dig up a plug and transplant it. For that matter, you can even put a stem of mint in a glass of water to make it form roots and then plant it in the garden. In dry climates, mint will need irrigation to grow and thrive, but in humid places there is generally sufficient rainfall to keep mint growing happily. There is little reason to waste compost or fertilizer on mint, as it will grow rampantly, even in marginal soils. Moisture is the main limiting factor, though full sun or deep shade will hamper it a bit. Pests and disease are typically not an issue with mint. Other than removing it if it grows into areas where it not desired, there is very little maintenance associated with growing mint. In fact, the only form of maintenance necessary is to cut it back once or twice per year. If you cut mint back to within three or four inches of the ground in late summer after it finishes flowering, it will send out a second flush of growth - otherwise, it tends to look tattered at that time of year. In late fall, cut it all the way to the ground so it can regrow fresh from the roots in spring. Pick mint in the morning after the dew has evaporated for best flavor and aroma and use only the upper leaves that are fresh and green. It's best to harvest it early in the season before it goes to flower. 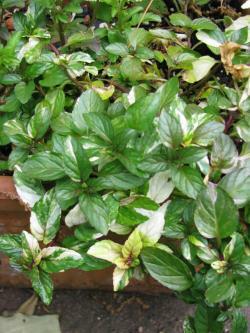 'Chocolate Mint' is a type of peppermint with a hint of chocolate flavor and hardy in USDA zone 4-10. 'Apple Mint' has fuzzy, light green leaves and emits a green apple aroma and it grows well in USDA zones 5-9. 'Variegata' has splashes of white and yellow on the leaves. It is hardy in USDA zones 6-9. 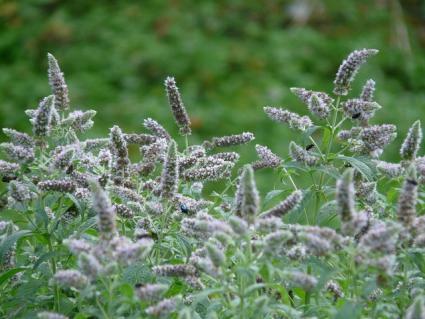 'Curly Mint' is a type of spearmint with crinkly foliage; grow it in USDA zones 5-10. 'Pineapple' has a tropical fragrance and variegated foliage and is hardy in USDA zones 5-11. Mint is the easiest herb to grow and is endlessly useful in the kitchen. Its lush growth habit also makes it useful in the garden - as long as it doesn't get out of hand.